I hope that everyone has a great day spending it with someone or something they love today. Whether it is a spouse, child, friend or just a pet, I hope your day is wonderful. I will spend my day with my family today or part of it any ways, I really don't need a special day dedicated to love for me to do that. I love doing that anyways. However my husband did surprise me with flowers the day before yesterday cause I wouldn't be expecting anything a couple days early. He was right! I love them they are beautiful red roses. Anyways Happy Valentine's Day to you, now on with the challenge today. 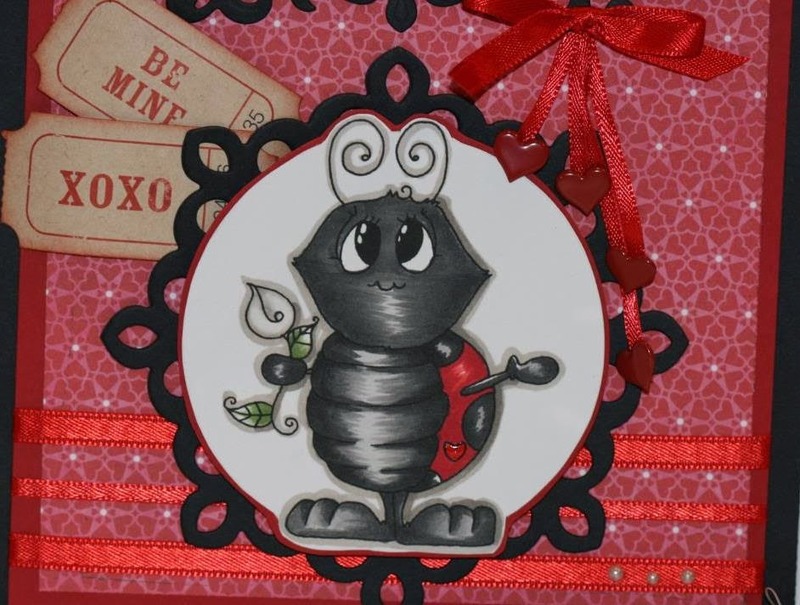 This is the card that I made using a sweet image from Miss Rach called Lady love bug that can be found on the whimsy store. Super fun image to make a valentine's card with. If you want to jump over to the Whimsy challenge click here. Great to see you again, have a wonderful day! Great coloring on your cute little bug! Thanks for sharing this adorable card with us at www.7kidscollegefund.com! This is darling, Charlene. Super sweet card, and I'm SO delighted and blessed to have you share with us in our challenge this week. Please stop by again soon to fellowship and share with us. We're so grateful to have you along this week. Soooo cute. Thanks for joining us at BunnyZoe. Such a cute card, Its fab to join the Whimsy team for such a fun challenge! Oh this is so sweet! It's been so much fun to team up with the Whimsy Digi DT this week!